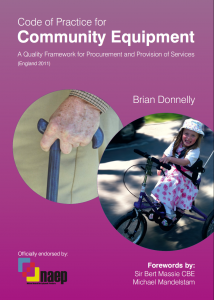 “Brian Donnelly’s book successfully pulls together all the complicated nuances relating to the provision of community equipment, and appears to be the only publication to do this. It is relevant to many healthcare professionals, and their managers, who are involved in the provision of equipment, and to a wide range of users of all ages. The book sets out a code of practice, with 47 standards, the development of which has been supported by stakeholders in the field of community equipment. The standards are aligned with existing and developing structures and regulatory requirements in the NHS, and cover every aspect of equipment provision from commissioning to professional responsibilities and specialist areas. For a subject that has the potential to be turgid, each standard is clearly written, broken down into manageable subsections, and grasps its reader through its relevance. All of us who have been involved with equipment provision have faced challenges relating to, for example, equipment decontamination, out-of-hours cover and risk assessments. In addition, the book includes useful appendices, such as legal and welfare frameworks that need to be considered, a guide for contract management indicators, and guidance relating to medical device management.